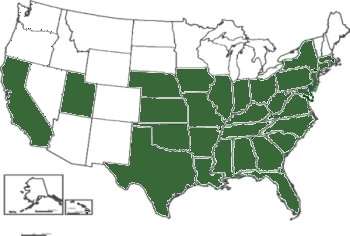 Botanical name: Diospyros virginiana L.
Range in New Jersey: throughout the Coastal Plain excepting the Pine barrens; not as common through north Jersey. Misc. 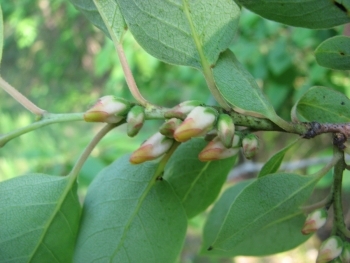 The fruit is edible when completely and fully ripe, preferably after a frost. Molasses can be made from the pulp, tea can be made from the dried leaves, and it has been used as a coffee substitute. 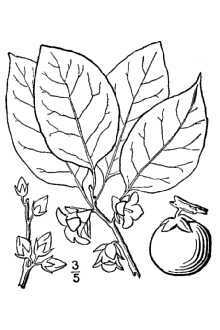 Stone, in 1910, says "The Persimmon is one of the typical Carolinian trees which give to the low woods of western New Jersey their austral tone. Its distribution is identical with that of the Opossum, which likes so well to feed upon the ripe fruit ...the type whose name is closely associated with..'Possum ... in the folk lore of the South...There is quite a difference in the fruit of different trees, some bearing decidely ovoid fruit, while on others it is merely globular. As the leaves fall in mid-October the Persimmons become quite conspicuous, hanging tightly on the branches, their bright, russet-red coats shining in the sun; but their proper flavor is not acquired and the astringency modified until they are touched by frost and their skin somewhat wrinkled and turned purple; and those that are picked up from among the frost-covered leaves in late November or December are perhaps the best of all" (634).